To register for 2019 courses, please carefully follow the below instructions and link to the online registration platform. Step 1: search for your name to find an existing account and retrieve your password, then start your course registration. Step 2: if you do not have an existing account (e.g. 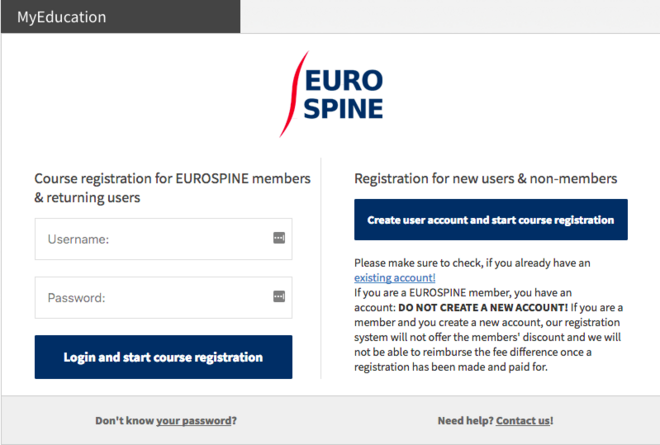 if you are not a member of EUROSPINE and/or have not participated in the Education Week in the past), set up an account and then start your course registration. If you are a EUROSPINE member or participated in a past Education Week, you have an account: DO NOT CREATE A NEW ACCOUNT! If you are a member and you create a new account, our online registration platform will not offer the members' discount and we will not be able to reimburse the fee difference once a registration has been made and paid for. If you are a member, also please ensure you have paid your 2019 membership fee prior to starting your registration process in order to benefit from the member's fee!